"Hack and You Shall Find"
It seems though that through his snooping into Batman's files, Robin has uncovered the plot. 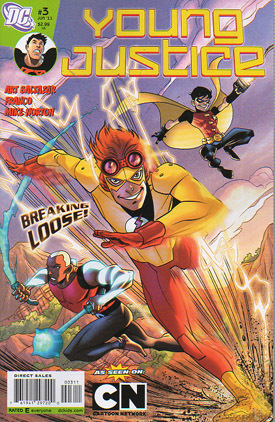 Meeting Kid Flash and Aqualad he suggests that they take on a mission with out the Justice League's approval to prove they can be a team. Aqualad is unsure and curious as to why Robin excluded Superboy and Miss Martian. Robin points out they are the most experienced and used to working as a team with their own partners of Batman, Aquaman and Flash. Later that night, in costume they monitor Selena Gomez from a nearby building. Seeing an assassin scaling the wall outside Selena's office Robin and Kid Flash race over to intercept him. Aqualad left behind, is attacked by the assassin's partner, a man with a robotic hook for an arm! The lack of teamwork means an unprepared Aqualad is easily knocked out and captured. The other assassin reveals himself to be Black Spider and he promptly takes care of a cocky Robin and a glory hungry Kid Flash. The two assassins meet and throw their prey together. Plans out of the window, Robin tries a second attack, the distraction is all Kid Flash needs to race in to the building and rescue Selena. Sadly the 'fly by the seat of your pants' plan fails too and the better prepared villains quickly overpower the duo and capture Selena for themselves. Aqualad finally comes to but soon regrets it as he sees their monumental failure, trapped in Black Spider's webbing and Selena about to be killed. Story - 5: Another story taking place in between episodes of the animated series focusing on the 'seasoned professionals'. However their individuality and lack of teamwork is their undoing. A perfect story to portray their individual strengths and weaknesses. I'm not familiar with the two assassins, so it would have been nice to have a little introduction to them, but as it is I am looking forward to the second part of this story in the hope it resolves their team work issues before they meet Mister Twister and Bane. Art - 3: The art is as solid as ever, the characters look just right in or out of their costumes. However, as accurate as the art is, and true to the spirit of the animated series - it lacks punch this issue. Nothing daring in composing scenes. It just seems very 'run of the mill' and that's a shame as the book IS visually beautiful. I just know it has been better and could escalate further if they pushed the boundaries. Cover Art - 4: The cover is the exact opposite in terms of the boundary pushing, it has the excitement and energy the interior art is lacking. Kid Flash never looked better.